Earlier today, Saturday, February 3, 2018, word started sweeping through the cryptozoology and Bigfoot community of the grave condition of Jc Johnson, the founder and President of Crypto Four Corners, who had been placed in a medically induced coma due to an illness in his lungs. John “JC” Johnson, 53, Menahga, Minnesota, died Saturday, February 3, 2018, in Essentia Health, Fargo, North Dakota. By this afternoon, it was confirmed that Johnson had passed away today, 2/3/2018, at 12:40 pm, due to complications from pneumonia. 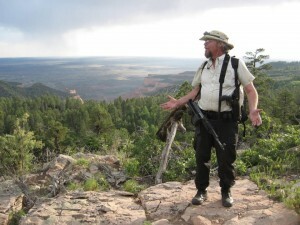 JC Johnson, who some of his friends called the “Indiana Jones of Cryptozoology,” founded and lead a group of dozens of enthusiastic and determined researchers focused on a variety of strange and mysterious creatures in the Four Corners area of Arizona, Colorado, New Mexico and Utah. This group’s research included Bigfoot, giant snakes, living dinosaurs, werewolves, dragons, giant birds, pterodactyls, centaurs, Native American “Skin Walkers,” and other cryptids frequently reported in this wild and remote region. Johnson had been a professional river and outdoor guide for more than 20 years. 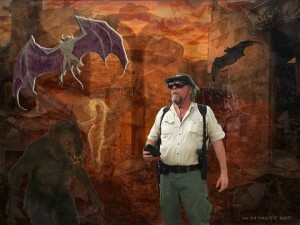 His experience, knowledge, attunement to nature and undying faith make him a driving force in the field of cryptozoological and unexplained phenomena research. Rest in Peace, Jc Johnson. Some ten years ago I began my journey into the Bigfoot field researching genre. Back then I really didn’t know what I was doing, and was green behind the ears on knowledge of the creature. What I did know was that my first experience and encounter with the Sasquatch species was real. One of the first men I met in the field was Jc. He had more knowledge and expertise than anyone else I would come to meet in Sasquatch. He knew the southwest like the back of his hand, and like me, he had formal training in the ways of the Medicine Man. 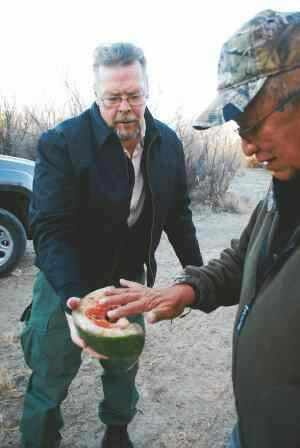 He knew the Sasquatch, and knew it’s behaviors, and our friendship helped me to grow as a researcher. I will always be thankful for the advice and time he gave me as a fellow researcher. One of the biggest lessons he taught me was, ” If you need yellow and red circles to prove your point, its probably not worth it.” The Bigfoot Community in America has lost one of its all time greats. God Speed Jc, your Spirit Horse awaits you ! 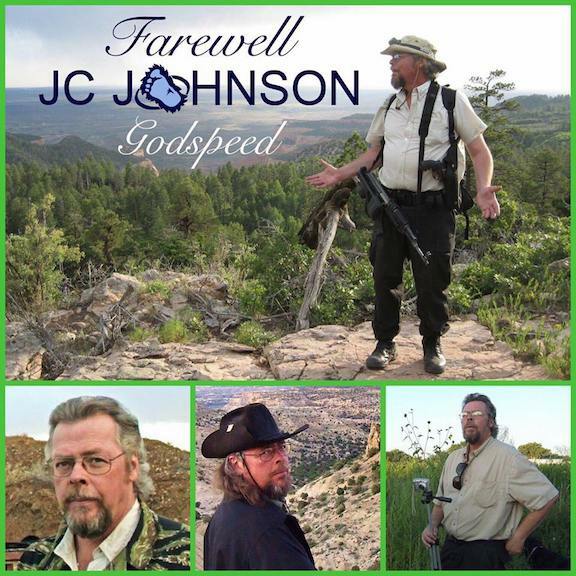 It truly devastates me to bring this news to you as a member of Cryptids Four Corners, our founder Jc Johnson- Left this earthly plane for the StarPath and onto other journeys that we won’t be on with him any longer. Prayers and condolences go out to all the other members, friends and family of JC! A very worldly, open-minded man, that has been with us since the beginning of our journey and a huge mentor in our life. Will miss you big guy and see you on the other side! Jc Johnson was the real deal. A extremely kind and wonderful person. A staple in the Bigfoot world but also someone I’d call a friend. He would take my phone call anytime so I could bounce my looney encounters/evidence off him. R.I.P. my ol’ friend, Godspeed! Thank you for all of your thoughts and prayers. My dad put up one hell of a fight. Around 12:40 today he passed away. I am in shock and am utterly heartbroken. He is a massive part of my being and I’m so proud to be his daughter. I will have more details about what’s next for those who knew him in the near future. He is at peace and this earth will never be the same without Jc Johnson walking through it’s deserts and swamps or kayaking it’s rivers. I love you, dad. Jc Johnson was the CEO and President of Crypto Four Corners. He lived in International Falls, Minnesota since June 19, 2017. His hometown was Teec Nos Pos, Arizona. Condolences to all of Jc’s family and friends. I am devastated to hear the news of JC’s passing. I only just heard about this. He was a great colleague and wonderful friend whom I met while on Facebook. The Bigfoot community has lost an amazing researcher. Rest in peace dear friend. You will be missed but not forgotten. 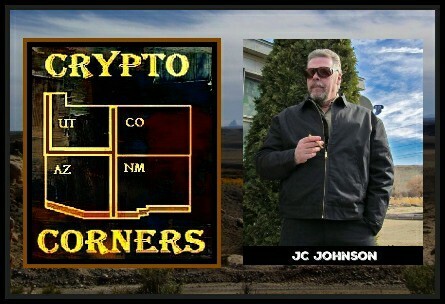 JC Johnson and I formed Crypto Four Corners in 2004, to investigate things out of the ordinary in our region of the USA. He was a good guy, always ready to step out the door and check out something in the rivers, forests and mountains of our beautiful land we call home. JC will be missed greatly.